With the (2017) College Football FBS season a quarter of the way complete, its time to start posting my weekly rankings. My weekly rankings are first and foremost posses no bias or favortism. However, are determined based upon statistical analysis, overall records, schedules, scheduled games versus FCS or not, and other statistical data to support the rankings. What I do not possess, is the crystal ball style of predictons, like the major sports media “experts” from ESPN and FOX. I do not possess any confidence in the ESPN FPI (Football Predictor Indicator) system, because it possesses no merit in accuracy or ability to possess some form of confidence in the use of the system. It seems that every week the sports media of ESPN and FOX keep changing their minds on who will win the current week, who the Top 4 should be in the CFP (College Football Playoff) and ranking their Top 10 with no true analyitical support, but possessing a bias and favortism. The most interesting aspect of their flip/flop mind changes is it changes each week. From a certified researchers position, we never make predictions without evidence and data to support our questions. Finally, we never predict who will be in th playoffs until all data has been collected which provieds us with enough information to support our rankings and playoff teams. Within my rankings, I will offer other statistical data that NONE of the ESPN and FOX sports media “experts” collect or even use to support their rankings or cognitive thoughts in debates or in open discussions on set. These sports media members debate or discuss based upon passions or the eye test, not really examining specific data points which should assist in their thoughts. Within my rankings, you may observe many data points which are equal in ranking but ranked differently, its early. Those data points will change as the season progresses week to week. KEY: A- Rank, B-Team and Record, C- FCS Game or Not, D- Number of Extra or Less Home Games or Balanced Schedule, E- Rank and Percentage Rate of Overall Non-Conference Opponents Cumulative Records, F- Rank and Percentage Rate of Overall Cumulative Records of Scheduled Oppenents Records, G- Rank and Percentage Rate of Overall Cumulative Records of Scheduled Conference Opponents Records, and H- Offensive Rating Efficiency (Number of Times Scored divided by Number of Total Possessions). Honorable Mentions: Auburn (4-1), Virginia Tech (4-1), Texas A&M (4-1), Duke (4-1), SMU (4-1), Central Florida (3-0), Texas San Antonio (3-0) and Miami (Fla.) (3-0). As I post my next set of rankings, Columns C and D will be omitted. The rest of the colums will be included. If you have any questions please feel free to ask or contact me on twitter at cfbpoexpert If you want to recite and verbalize what you have read on my posting, please follow MLA/APA format and cite your sources by stating where you read the posting. As the college football season continues, the rankings will be shaken up, there will be more surprises that even the sports media “experts” from ESPN or FOX can’t even predict. No matter what type of crystal ball they possess. Best of Luck to all FBS programs competing this 2017 season. During the recent college football media days for all of the Power Five (5) Conferences, the head coaches of each program receives the opportunity to speak with the sports media about the upcoming season and address any questions the sports media might want answered before the start of the (2017) college football season. The most interesting comment from a FBS football coach came from none other than Coach Nick Saban, from Alabama, respresenting the Southeastern Conference (SEC). The comment , in which I heard, was aired on ESPN Radio and many ESPN sports media shows either on television or the radio. The ESPN Radio show in which I heard the comment was on the Freddie and Fitz Show on ESPN Radio stations braodcast across the country, between the time frame of (1130PM-1145PM) on Wednesday, July 26, 2017. I also searched the World Wide Web to support these comments from Coach Saban and found a published news article either on line and/or in print from the Washington Post dated July 27, 2017; Titled “Nick Saban’s “far out” scheduling plan would be great for Alabama, less so for everyone else”, authored and published by Matt Bonesteel ( Bonesteel, 2017). Coach Nick Saban was participating in the annual magical mystery tour of college football coaches for ESPN, as ESPN begins to promote the upcoming college football season of 2017, by interviewing as many high profile coaches in Bristol, Connecticut. During Saban’s tour, Saban pitched the “so far out” idea that would seem to guarantee both an increase in competitive regular season college football games and an expansion of the College Football Playoff, two noble goals. (Bonesteel, 2017). Saban is using his Democritus, righteousness philospophy and entitlement beliefs, to promote the far out idea so that all Power Five (5) Conferences should only play Power Five (5) Conferences. Saban’s comments were “We should play all teams in the Power 5 conferences,” he said. “If we did that, then if we were going to have bowl games, we should do the bowl games just like we do in the NCAA basketball tournament — not by record but by some kind of power rating that gets you in a bowl game. If we did that, people would be a little less interested in maybe bowl games and more interested in expanding the playoff.” (Bonesteel, 2017). With all due respect Coach Saban, please offer us your cognitive thoughts on what variables to use for the power rating system. Saban’s argument for the change in his and possibly the SEC’s Democritus mindset is that their belief is that the current use of the mimimum win total of six (6) to become bowl eligible causes scheduling advantages to those who schedule the Group of Five (5) or FCS programs are not worthy of their wins. Coach Saban you are clear violation of your own words. Saban also believes that by scheduling only Power Five (5) programs and a 10-game in within confernce schedule, plus 2- non-conference scheduled games versus Power Five (5) programs; that it will improve financial dollars, increase excitement and possibly increase the number of entrants into the next college football playoff format. Coach Saban, since you brough up the 10-game conference schedule have you performed the scheduling rubric to make happen? Im going to hypothesize that you have not put this cognitive thought to paper with ability to address any questions that may be asked of you in how this system works. From the way I see this chess match move by Saban and the SEC, their Democritus objective is to significantly improve their stronghold and stranglehold on the top financial prize of college football and the elimination of, Democritusly control of and stranglehold on the Group of Five Conferences and their programs, including the Independent FBS programs. The power brokers of college football, more specificially the SEC want to eliminate the Group Of Five’s (5) ability to increase their marketability, increase their recruiting of student athletes, and ultimately and significantly diminsh their abilty to increase financial stability under the NCAA blue logo and athletic competition at the FBS level of college football. Bonesteel (2017) concludes his article by punching holes, like swiss chees, into Coach Saban’s idea. Bonesteel (2017) reconfirms how the historical schedules of Coach Saban at Alabama when competing against various FCS programs multiple times. Then Bonesteel (2017) serves up to Coach Saban which FCS program, Mercer, is scheudled for “the SEC’s annual late-November FCS siesta weekend” prior to rivalry weekend versus Auburn in the last week of the college football season on Thanksgiving weekend. Bonesteel (2017) states that ” Saban could snap his fingers and take those games off the Tide’s schedule, but doesn’t.” That’s the righteousness position that Coach Saban takes in addition to the SEC. Both believe that they can suggest any type of change to the rules, scheduling, selection process and or bowl process; and will use any leverage they can to persuade others within their conference or level of competition to join their crusade. Coach Saban and the SEC both forget that when they verbally start their crusades for change, they open up Pandora’s Box. Let’s open Pandora’s Box and read what is inside the box. With this change Coach Saban and the SEC, you failed to remember or read your NCAA Bylaws of (2017-2018), more specifically the membership chapter. NCAA Constitution Article 3, Chapter 3, disuccess Membership including Bylaws that you need to read are; Bylaw 3.1, Bylaw 3.3, Bylaw 3.3.4, and Bylaw 3.7 (NCAA, 2017). After you read that Coach Saban, then move to the NCAA Constitution Article 20, that discussess FBS requirements for NCAA programs to earn and maintaint their FBS status. From there Coach Saban, read the rest of the NCAA Bylaws that pertain to eligibility, recruitment and academic compliance. All of which are followed by those FBS members under the blue NCAA logo. After you read that Coach Saban, you need to understand how Title IX possesses a direct relationship with the NCAA and FBS status requirements. Since, college athletics are being operated in a business-like manner in today’s society by generating triple digit millions of dollars and revenue, then Coach Saban you need to understand how the Sherman Act of 1890 protects the Group of Five (5) Conferences and programs, then in addition to your readings read the Clayton Act of 1914 as well. While you are reading that Coach Saban, you failed to forget about the Notre Dame Factor. Coach Saban please explain to Notre Dame why they won’t be part of the Power Five (5) scheduling since they are not officially part of a Power Five (5) Conference for FBS football. I believe what Coach Saban is refering to is that he would like to see implemented, a standardized, universal, cross conference, cross divisional and balanced scheduling rotation format like the National Football League (NFL). Interesting his thoughts might be in the right place but that research has already been performed, copyrighted and published. 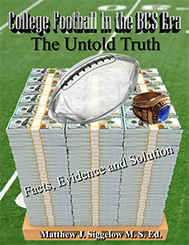 Published and available for sale is “College Football In the BCS Era The Untold Truth Fact Evidence and Solution” authored by Matthew J. Siggelow M.S.E. The research within the book, Chapter 16 titled “Balanced Scheduling: Possible or Impossible”, examined the many dependent variables on the independent variable that affect what Coach Saban is thinking about. What that published and copyrighted research did determine is that college football at the FBS level could possess and implement a standardized, universal, cross conference, cross divisional and balanced schedule by scheduling all 131 FBS programs and conferences within a 12-game schedule with NO home field advantages of more than 2 home games successively and has the capability to eliminate the scheduling of any FCS programs. However, within that format the research did adhere to and maintained as many rivalry FBS games already scheduled and implemented other historical rivalry games already not being played. If Coach Saban wants this implemented, please ask and I am more than willing to act as the scheduling czar that the NCAA and FBS football scheduling needs. I just hope that Coach Saban and the rest of the SEC are OK with a games scheduled in late November at Wisconsin, or at Michigan, or at Minnesota, or at Michigan State, or at Ohio State, or at Stanford, or at USC, or at Washington, or at Nebraska, or at Iowa and the list can go on and on. Once they give up control of the scheduling to a shceduling czar, you go where you are scheduled. No more so called “neutral site” games with regional home field advantages. With this type of scheudling format; the SEC programs, the power brokers of FBS football, the SEC Athletic Administrators and the SEC Conference Commissioner will have to agree and abide by this type of scheduling. The SEC would then not be allowed to control their Non-Conference schedule, like they do now. We all could agree that the SEC and coaches won’t budge on their traditional within conference games, scheduled on specific weeks within the calander, during the college football season. Heaven forbid if they let that happen. To support the righteouness, entitlement, Democritus, and historical SEC scheduling further; from (1996-2013), the SEC holds a 79.9% home field advantage in thieir non conference scheduling. Examining those data points further, Coach Saban you and your Alabama teams holds the highest percentage associated with home field advantage at 90.7% within your non conference scheduling advantage. In addition to Alabama possesssing the highest percentage rate for home field advantage within their non-confernce schedule, there are four (4) other SEC programs that rank in the Top 6; with Auburn at 90.6%, Arkansas at 89.1%, LSU at 84.6% and Florida at 82.8%. What many fail to perceive, even the sports media is that this significant hoime field advantage within the SEC’s non conference schedule is currently in use during the early infancy stages of the College Football Playoff (CFP) Era. Those statistics are increasy yearly by (.1)% yearly. Do you really think and believe that the rest of the Power Five (5) Conferences and programs are just going to submit to your demands of always scheduling non-conference games with Alabama and the SEC at the SEC home stadium venues. The remaining FBS Power Five (5) programs and conferences will say NO, to that move. What Coach Saban and the SEC fails to comprehend is that college athletics although business like and operating in a business fashion, draws many fans, 37+ million to be axact annually, generates a plethora of sponsorship dollars, donations from booster dollars, and plenty of sports media coverage. College athletics needs to be operated and lead by someone who possesses a Utiliatrianistic style under the Stuart Mills philosophy and definatively possesses business experience. What the SEC and Coach Saban significantly fail to comprehend, is that college athletics is about offering opportunities for ALL student athletes and coaching staffs to compete and earn national championship in ALL NCAA sponsored sports, except for FBS football under the NCAA logo. In conclusion, conference affiliation or Power Five (5) Conference status should not give you exclusivity, entitlement, or the righteousness to the highest prize on the table of $50+ millions of dollars and the opportunity to be called National Champion in which all FBS members adhere to and follows the bylaws of the NCAA and FBS eligibility status. All FBS programs should be allowed to compete for that prize and recognition. That prize and recognition is not just for the elitest in college football at the FBS level. To Coach Saban and the SEC, better be careful what you wish for. Coleman, Freddie (Host)and Fitzsimmons, Ian (Host) (July 26, 2017). Freddie and Fitz Radio Show. Monday through Friday. (Saban thoughts on P5 Scheduling). Bristol, CT. and Dallas, TX. ESPN. Siggelow, Matthew J. (2016). College Football In The BCS Era The Untold Truth Fact Evidence and Solution. Lulu Publishing. Self Publishing. 490 Pages. 2017-2018 NCAA Division 1 Manual (2017). Text Prepared By: NCAA Academic and Membership Affairs Staff. Production By: NCAA Academic and Membership Affairs Staff. Produced by the NCAA. Indianapolis, Indiana. NCAA.org. 428 pages. What an exciting year for College Football. So many great games this 2016 FBS season and so many FBS programs either surprised us, let us down, under performed than expected by the oh so “credible” ESPN FPI system and the experts pre-season analysis and predictions. So, let’s have REALITY tell us how this should work and play out, not “crystal ball” predictions like the sports media use my subjective vested interest in seeding and selecting. Reality…. Means this really happened the FPI didnt predict it or was right all the time: Oklahoma beats West Virginia, Washington beats Standford, USC beats Washington, Stanford beats USC, Clemson beats Louisville, Penn State beats Ohio State, Ohio State beats Michigan, Michigan beats Penn State, Ohio State beats Oklahoma, Wisconsin beats Nebraska, Michigan beats Colorado, Colorado beats Stanford, Alabama beats USC and many more. Within that last sentence are “cyclical triads”, something the CFP committee does not comprehend or knows how to handle this scenario. If reality were to come into play and use the professional model theory of seeding and selecting, then this is how my “MOCK” 16 team playoff seeding and selection would look like, with crystal clear explanations. I use research and data to determine my seedings and selction, and take into consideration to those who deserve and earned the opportunity to be part of this championship drive process, the $50+ Million dollars on the table, prestige, national accolades, and the earned right to be called National Champion. This is contingent on Navy beating Army. #2 Seed Alabama (12-0) SEC CHAMP, (76-55), (30-34), FCS game LATE in the season, played 4 more EXTRA Home games in the NON CONF schedule, played in the premier time slots and never had to really change customary behavior patterns on games played and times. All games on TV. #3 Seed Ohio State (11-1), (84-59), (41-40), played 1 NON CONF game on the road AT OKLAHOMA and WON, NO FCS game, played in the best FBS CONF this year in the Big 10, plus was (3-1) record vs. other teams ranked in my top 16, W vs. Michigan Wvs. Oklahoma, W vs. Wisconsin, L vs. Penn State. #4 Seed Clemson (11-1) ACC CHAMP, (79-52), (33-31), played 1 NON CONF game on the road AT AUBURN and WON, played and W vs. Louisville. #6 Seed Michigan (11-1), (81-64), (39-42), (3-1) record vs. those seeded CFB teams, W vs Penn State, W vs. Wisconsin, W vs.Colorado, L vs Ohio State, NO FCS game, played in best CFB CONF this year the Big 10. #7 seed Penn State (10-2) Big 10 CHAMP, (77-67), (35-46), (1-1) record vs. those seeded CFB teams, W vs. Ohio State, L vs. Michigan, NO FCS game, played in best CFB CONF this year the Big 10. #8 Seed Oklahoma (10-2), Big 12 CHAMP, (78-66), (36-45), (1-1) record vs. those seeded CFB teams, W vs. West Virginia, L vs. Ohio State, NO FCS game. #9 Seed Boise State (10-2), (75-70), (32-32), NO FCS game, W vs Washington State. #10 Seed Wisconsin (10-2), (76-67), (41-40), NO FCS game, (0-2) record vs. those seeded CFB teams, L vs. Ohio State, L vs. Michigan. #11 Seed Colorado (10-2), (80-64), (35-46), (1-2) record vs. those seeded CFB teams, W vs. Standford, L vs. Michigan, L vs. USC. #12 Seed South Florida (10-2), (65-66), (29-35), (1-0) record vs. those seeded CFB teams, W vs. Navy. #13 Seed Navy (10-2), (70-56), (29-35), (0-1) vs. those seeded CFB teams, L vs. South Florida. #14 Seed West Virginia (10-2), (66-66), (29-35), (0-1) vs. those seeded CFB teams, L vs Oklahoma, NO FCS game. #15 Seed USC (9-3), (78-66), (37-44), (2-2) vs. those seeded CFB teams, W vs. Washington, W vs. Colorado, L vs. Alabama, L vs. Stanford, NO FCS game. #16 Seed Stanford (9-3), (73-71), (41-40), (1-2) vs. those seeded CFB teams, W vs USC, L vs. Washington, L vs. Colorado, NO FCS game. Championship Game: Sugar Bowl: Last two left….. If you have any questions about this “MOCK” field of 16, please contact me, share this link and more. Please follow me on twitter at cfbpoexpert. If you read and talk about my posting, please remember to site the source and give proper APA/MLA citings. The final poll prior to the release of my “mock” field of 16 team playoff format shows that (12-0) Alabama remains #1 and (12-0) Western Michigan remains #2. This does not indcate that this how they will be seeded in my field of 16. During my review of the “mock” field of 16 teams for my expanded playoff format, 5 have been officially seeded, with 11 spots remaining to seed. With one OFFICIAL week of college football left with conference championship games and scheduled games in the BIG 12 and Sun Belt Conference, there could be some changes within my field of 16 with games remaining and FBS programs who are in the clubhouse at (9-3) could sneak in to my field of 16. Scheduled games of importance are; Oklahoma vs. Oklahoma State, Navy vs. Army, West Virginia vs. Baylor, Troy vs. Georgia Southern, and a few more. An Oklahoma State win vs. Oklahoma could put (9-3) USC in my mock 16 team playoff seedings, as they are just on the outside looking in for my field of 16. Both South Alabama and Louisiana-Lafayette couls still earn bowl eligibility if they win this Saturday to earn their 6th win. Both of those wins would make a total of bowl eligible programs at 78, with 11 to 13 FBS programs with (5-7) records to be reviewed for any open bowl slots to be filled. There was some minor changes in this weeks polls with ranked programs from last weeks rankings. Within my weekly rankings this week, there are 5 Big 10 programs and 1 SEC program ranked. This tells me that the best FBS conference this season belongs to the Big 10 this season. When you read the rankings , please be aware of the extra data points in how they are used to make an assessment. Not a subjective assessment, but a quantitative assessment to assist in ranking and seeding. And now for this weeks rankings. Next week, I will post my weekly rankings and the “mock” fictional 16 team playoff brackets in what could be in the future of college football. Alabama remains the #1 ranked FBS program in my weekly rankings, but is seeded #2 in my early MOCK/Fictional 16 Team Playoff Model. The Broncos from Western Michigan are ranked and seeeded opposite of Alabama at #2 and #1. The first order of business, is can both Alabama and Western Michigan remain the only 0-loss programs left standing after the 12regular season game schedule is complete? Research supports and states that on average there are (2.62) 0-loss programs per each FBS season. We have one week remaining in the FBS regular season. Alabama (11-0) hosts (8-3) Auburn, while (11-0) Western Michigan host (9-2) Toledo. Both games are not easy games to win as Alabama and Western Michigan look to stay un-defeated. We shall see which one of these two stay at 0-loss or who falls into the 1-loss group. Weekly rankings and seeding criteria are different in relationship to how each assigned ranking and seeded number is applied to each FBS program. The playoff seeding rank is a quantifiable process based upon research and multiple quantifiable variables which are standardized and used for all FBS programs. This weeks Playoff (PO) seeded positions are not 100% accurate, but a quick look at where the seeding of the mock field of 16 would be seeded. Preliminary seedings indicates some great first round games. Looking quickly at the games we would possibly have are ; Alabama hosting Houston, Western Michigan hosting Oklahoma State, Boise State hosting South Florida, Ohio State hosting Colorado, Michigan hosting Nebraska, Clemson hosting Wisconsin, Washington hosting Louisville and Penn State hosting Oklahoma. I can guarentee you all of those games would be exciting and SOLD OUT. Currently, 65 FBS programs are bowl eligible with another 18 FBS programs still eligible to become bowl eligible with 5-wins and 1 or 2 games remaining on the FBS season. If all 18 eligible FBS programs win their last games then, the total number of bowl eligible FBS programs would be at 83 and no need for any (5-7) program to be considered for any open bowl spots. The last week of college football will be entertaining to watch all weekend long, starting with 3 MAC games on Tuesday night and concluding with UMass and Hawaii on Saturday. OPP W/L Record- The Combined Overal W/L Record of ALL Scheduled FBS programs that you played to this point in the season. OPP %- The W/L Percentage Rate of the combined OPP W/L Records. CONF W/L Record- The Combined Overall W/L Record of Scheduled FBS Conference Opponents ONLY, already played to this poing in the season. PO Seed- Current Mock Playoff Seeding in my ficticious 16-Team Playoff Format. This seed number is not accurate or solidified until the completion of the 12-Games FBS season is complete. College Football In the BCS Era, NOW Available!!! Book Price $35.00 on sale now for 20% off at $28.00. First 200 sold receives this discount!!!!!!! A new book that examines college football at the FBS level in how they determine their national champion in the BCS system is now available. This research can also be applied to the new 4-team CFP system as well. I originally authored this liteary work in 2013. After a few months I re-exmained what I had published and wrote. The analytical wheels started spinning and I left out very important information and data that needed to be explained more clearly to the readers in this sports arena of college football, mainly the sports media. Three years later , I proofed the original work, updated Tables and then I added three (3) new chapters and one of them examines the Sherman Act. Within this book, there are 19 Chapters that examines many variables and sub variables within college football and how they determine their National Champion. The book is 516 pages in length with Reference pages included. I used 30+ Peer Reviewed Journal articles which were subject specific to variables. I read 10 published literary works or books that were and are educationally authored by doctoral professors within the field of Athletic Administration and Sports Management. Additional readings included from authors who published books/literary works from the sports media who cover sports and college football. I examined over 25,000+ data points to assist in determining how to rank FBS programs based upon dependent and independent variables which affects the BCS and current CFP system used. There are over 100+ Tables of data to assist the reader in understanding the reality of college football and how subjectivity and the poll system is not a valid system in ranking FBS programs week to week. The tables and data inside the book are written in general mathematical notations, meaning percentages and numbers. I wanted the reader to understand the data and numbers and not get lost in F or P Values. All of this data and reading allowed me to put to test my theory if whether college football at the FBS level can possess an expanded playoff format congruent with the bowl system, without eliminating any bowl games, and without extending the current season and making sure the playoff format did not interupt academic finals weeks. My research has determined that college football at the FBS level CAN possess an expanded playoff format with 16 teams. This research also proves that of the 16 FBS seeded programs, 12 spots would be secured by BCS/Power Five programs and 4 spots would be secured by Non-BCS/Group of Five Prorgams. All the Non-BCS/Group of Five programs want is the ability to participate for the National Championship, the $50 Million dollars thats at stake and the national accolades that comes with winning the FBS National Championship. With the the curren CFP and past BCS systems in use, the Non-BCS/Group of Five programs are not eligible and vehetmetly excluded to compete for the National Championship and the $50 Million dollars. NO matter if Boise State, Western Michigan, Tulane or any of the other Group of Five programs that finish the season with 0-losses, they are not eligible to compete for the National Championship, and the $50 Million dollars at stake. My playoff format allows ALL FBS programs the ability to be selected and seeded in the field of 16 to earn the National Championship in college football at the FBS level of play. Within a chapter in my book there are mock/fictional playoff brackets that shows how the playoff format could work, how each FBS team was seeded and those FBS programs that just missed the cut. It’s not impossible to see this coming to fruition in the future. The media now is OK with the CFP 4-team playoff and with the current chaos within college football now, they want the playoff to be expanded to 8 and thinking 16. This research and literary work shows that an expanded playoff format can work, be successful and exponentially financially beneficial for college football at the FBS level of play. Chapters titles in the book include but not limited too: Reason for Change, Eight Variables that Affected the BCS, Non-Conference Scheduling and the FCS, The Significance of Home Field Advantage, Analyzing the USA Today Coaches Poll, Reality versus Subjectivity, The Untold Truth about the SEC, Balanced Schedule: Possible or Impossible, The Sherman Act vs. NCAA and the Power Brokers and the Future Business Plan for the 16-Team Playoff. Purchase your copy at Lulu.com or by clicking on the book in the upper right corner of my blog page which has a link attached to the image. The link takes you directly to the book page for purchase with a small review. Please leave a comment about the book once you have read it. This is a perfect book for your college football fan in your family, friends, educators in Athletic Administrators who can use this book for curriculum purposes in acadamia for thier students in Athletic Administration and Sports Management programs. The Crimson Tide from Alabama at (10-0), one of two 0-loss programs remaining, retains the #1 ranking in my weekly poll. The other 0-loss program left standing are the Broncos from Western Michigan at (10-0). The main sports media in print from the USA Today and television from ESPN won’t recognize the feat in which the Broncos have amassed in remaining un-defeated like Alabama. The best way to interpret this type of media coverage from television and the print media is, Western Michigan is from that side of the tracks and they don’t play the same teams we do. We (the Power Five Conferences and Programs) are “entitled” to this type of coverage and are “MORE deserving” of the $50 Million dollars on the table, the accolades that come with that and are the only programs “allowed to” be called “National Champion” in college football in the CFP era, under the NCAA blue logo. If Western Michigan stays un-beaten, 0-loss, or un-feated; then by all rights they should be part of the the CFP 4-team playoff, no matter what their conference affiliation is or classification that the NCAA/FBS group of power brokers and sports media classify them as. No FBS programs beat them, they would have won ALL thier games; so why leave them out. Does not CFP mean College Football Playoff, meaning all college FBS programs who compete. I believe that the CFP chairperson and Texas Tech Athletic Director Kirby Hocutt, need to re-examine and evaluate the protocol of the selection process for the CFP and $50 Million dollars on the table for winning the National Championship at the FBS level of play. All FBS programs should be eligible to be selected for the CFP 4-team playoff, unless they are on probation, and not the select group to earn and be called National Champions in college football. The higher level of critical thinking to evaluate, rank and seed college football programs is tough enough but when committee members have vested interest, lack of knowledge or experience to select and seed; then you only punish those who are deserving to be part of the CFP 4-team playoff versus name brand program who should not be part of the process. There were some credible wins by FBS programs that upset ranked FBS programs to earn thier bowl eligible status. Wins by; Eastern Michigan, Georgia, Iowa, Pittsburgh and yes Idaho earned their 6th win this past weekend, making them bowl eligible. Idaho might want to re-think their decision on returning to the FCS level of play after the 2017 FBS season. Congratulations to those programs for earning bowl eligibilty. As of to date, there are now 57 bowl eligible programs, 21 FBS programs with 5-wins and needing one more win to earn bowl eligibility; and 18 FBS programs with 4-wins with at least two chances or more to earn their 6th win on the season to become bowl eligible. This weeks rankings has an additional category to it, and that is my fictional/mock 16-team playoff seeding number (PO SEED) if the college football season were to have ended last weekend and I were seeding and selecting the mock/fictional field of 16. The seed number you see now is not 100% accurate but close to accurate compared to the CFP 4-team playoff, since I “include” ALL FBS programs in my playoff format. Which 16 FBS programs will make the field of 16. This time next week, we could have part of the field entered, but not seeded. The last two-plus weeks of the CFB season is going to be interesting. There are still some great games left to be played and after this past weekend, anyone can beat anybody, anywhere at any given time. Something the main sports media does not understand or accept. Follow me on Twitter at @cfbpoexpert and direct your questions, comments and thoughts through Twitter. Alabama retains their #1 college football ranking within my ranking system for the fourth week in a row. Alabama (9-0) survived a scare from LSU, but the supposed “best” college football team struggels offensively. However, those CFB/FBS programs ranked below Alabama seem to outperform their opponents this past weekend by running up the scores to 50+ points to make a statement. The CFP committee possesses a challenge in ranking the college football programs 1 through 25. I did predict last week, that 0-loss Western Michigan woud be ranked no higher than 20th in the CFP poll. I was right, the CFP committee ranked Western Michigan 23rd. Wonder where the CFP committee will rank Western Michigan this week, 20th? I put more faith and confidence in (9-0) Western Michigan and have them ranked 4th this week. They have not lost, they have been consistant, earned their victoriesa dn their ranking within my poll. So why can’t the CFP committee rank Western Michigan in the Top 4 of their weekly rankings? One reason is that the CFP protocol DOES NOT allow any Group of Five CFB/FBS member access to the $50 Million Dollars at stake but can be considered for a bowl game with some prestige to it and I do believe its comes with a $10 Million dollar payout. The birdesmaid gift for going 0-loss the whole season. The second reason is, if and only if the 0-loss Group of Five FBS/CFB programs is ranked higher than any remaining Power Five Conference Champion but ranked the Group of Five FBS/CFB program must be ranked no lower than 12th in the final rankings. That means for any Group of Five member to gain financial accolades, they must meet specific criterion which is subjective and manipulative based upon the very “inexperienced” CFP committee, coaches who vote with vested interest and a media bias. Pretty hard to swallow for a CFB/FBS/NCAA member institution to abide by even though they pay thier annual membership dues to participate in college athletics, but vehetmetly withheld from the $50 Million dollars on the table and that crystal football to be called National Champion. 48 CFB/FBS programs have secured or earned bowl eligibilty with 6-wins or greater. 24 CFB/FBS programs are 1-win away from earning bowl eligibility. 19 CFB/FBS programs are 2-wins away from bowl eligibility and need to win 2 of their last 3 or 4 games remaining to earn bowl eligibility. Total number of CFB/FBS programs needed to participate in bowl games is 80.. will the bowls turn to (5-7) programs to complete the bowl season??? As the season concludes the rankings will stil remain the same but soon be transposed into playoff rankings. In the next two weeks, Alabama will add an FCS game to their total and any FCS games scheduled counts as a win or loss but does not count as part of your FBS schedule data. This means Alabama is more than likely not going to beable to retain their #1 rank in my poll. I will explain more when that happens. Comments, questions and debate welcomed by all. Let see how this final 3 weeks determine my field of 16. This college football seson has seen it share of great games and surprises. Alabama stills holds onto the Number 1 ranking in my weekly poll. However, there were some position changes with GREAT FBS programs below Alabama, who could and CAN pose a challenge to Alabama. Alabama (8-0) travels to Baton Rouge this week to play (5-2) LSU. Do not be surpired if Aabama falls out of the small group of 0-loss programs after playing at LSU. This college fotball season has seen its share of upsets, surprises and great story lines. With four weeks of college football left in the regular season schedule, excluding the traditional Army/Navy game, we are now down to five 0-loss teams left and still Western Michigan is not receiveing any credit in the weekly polls outside of mine. I rank the Western Michigan Broncos 4th in my poll. The published polls of the AMWAY Coaches Poll (a.k.a. USA Today Coaches Poll), and the AP Poll has Western Michiagn ranked 18th and 17th. When the CFP Polls are announced November 1st live on the “expert” sports channel, I bet Western Michigan is not ranked any higher than 20th. Just curious of those FIVE 0-loss programs left, who will remain standing at 0-losses? My bet is if Western Michigan is the ONLY remaining 0-loss FBS program standing at the end of the season, then the very in-experienced CFP committee won’t even give them a sniff or credibilty to compete for the “National Championship”, the $50 Million Dollars at stake and national acccolades for college football because of “CFP Protocol”. Can anyons say Sherman Act breach of anti-trust. As of the completion of this past weekends games, 37 FBS programs have earned bowl eligibilty. with a group of 24 5-win FBS programs waiting in the wings within the coming two weeks to secure bowl eligibilty. If all 24 5-win programs win this week and or next, that makes the bowl eligible group total to be 61. Right behind that group of 5-win programs, is a group of 25 4-win programs who are working towards bowl eligibilty. If all 25 of those 4-win programs earn bowl eligibilty, then we have a group of 86 FBS programs eligible for post season bowls and not enough slots. My guess is, that someone gets left out. As we get towards the end of the college football regular season, you will find that FBS programs will maintain thier rankings the majority of the time. Wyoming (6-2) makes my Top 25 rankings this week after pulling off a (30-28) win over Boise State, now (7-1). There were some other great games this past weekend, besides the Wyoming win over Boise State. If I were to select my field of 16 FBS teams for my mock playoff format, then my research and data holds true. The field would possess 11 Power Five Programs and 5 Group of Five Porgrams. Let the last four weeks of college football be fun, crazy, exciting and full of surprises. With the college football season playing within the last half of the season, upsets will occur as well as FBS programs maintaining their ranking and dominance. The last half of the college football season always seems to be the most interesting part of the season, since anything can happen from this half way point forward. Alabama (8-0) retains my number 1 ranking in this weeks poll, but could relinquish it after this upcoming weekend games and results. Even thought Alabama has a bye week this week, those (7-0) programs that play this weekend will make that (8-0) group more interesting to rank and easier to compare data against each other. Western Michigan moves up this week to the second ranked spot in my polls, as the only other (8-0) FBS team. There are five (7-0) FBS programs ranked behind both Alabama and Western Michigan. We will see who maintains their 0-loss records and changes their ranking position after this weekends games. The biggest surprise of the weekend was Ohio State losing to Penn State (24-21), which dropped Ohio State in my polls to being ranked 12th and Penn State enters my rankings at 23rd. Along the way there will be more surprises in store. Could those surpises be Alabama losing to LSU or Auburn. Could another suprprise be Western Michigan and Boise State both be the only remaining 0-loss programs left and vehemetly being denied opportuity to compete in ther CFP playoffs, the $50 Million Dollars on the table and the opportunity to be called “National Champion”. I guess we will see how the last half of the CFB season plays out. Conference W/L and %- Combined Conference Records of Conference Opponents already played win-loss records and percentage rate. These results are as accurate and fair as you can get compared to the USA Today Coaches Poll, the AP Poll and the soon to be release CFP Committee Poll.